The Turks and Caicos Islands comprise 40 islands and cays; only eight of them are inhabited. Located southeast of Florida below the Bahamas, the islands include the main island, Providenciales (also known as "Provo"), Grand Turk Island (home of Cockburn Town, the capital), the five Caicos islands, and Salt Cay. The original settlers were the Taino and Lucayan Indians. Salt was an island commodity, raked by the Bermudians during the 1600s. Today, the islands are becoming a leading offshore investment center. Katherine Lam. Fox News. Monday, 01 Apr 2019 17:30:43 GMT. Marie Kuhnla, 61, was found dead in the bushes near her resort on Oct. 16. ABC News. Tuesday, 11 Dec 2018 17:15:52 -0500. Provo is the most developed of the islands, and Conde' Nast magazine has rated it "Best Beach" for several years. 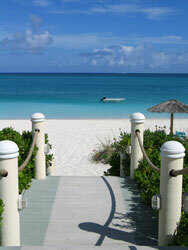 Hotels and resorts can be found on 12-mile Grace Bay beach at the north end of the island. Attractions on Provo include a unique conch farm tour and a friendly dolphin named JoJo, who visits Grace Bay frequently. Divers and snorkelers are drawn to the island by great underwater visibility, and fishermen seek out blue marlin, wahoo, and sailfish. An 18-hole golf course, fine dining, hotels, and spas are among Provo's amenities. Just east of Provo, North Caicos Island's beautiful north coast beach attracts residents, and the island's formerly Loyalist Wades Green Plantation intrigues historians. Connecting North Caicos and Middle Caicos is the Crossing Place Trail, facilitating trade between the islands for centuries. History buffs will also want to learn about Middle Caicos' archaeology and caves. Grand Turk, the capital island, has a cruise ship center. Cockburn Town is the islands' home for finances, restored churches, and the Turks & Caicos National Museum. Nearby Salt Cay, likely named for its 17th century salt industry, is a two mile long island with a very small population. In the first three months of the year, humpback whales migrating past the island draw curious visitors. Scuba divers are also attracted to this island's wall diving locales.